Book your room today at a discounted rate offer by EB5 Investors Magazine. 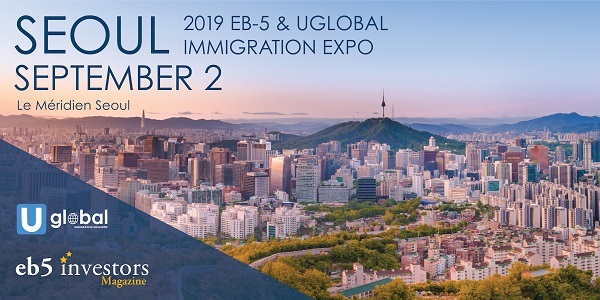 The 2019 EB-5 Expo Seoul offers high-quality education and networking opportunities to EB-5 stakeholders in the booming market of South Korea. This event attracts migration agencies, immigration attorneys, EB-5 service providers, regional centers and project developers from across the world. Our educational panels moderated by industry experts provide valuable insight about United States’ EB-5 Immigrant Investor program. The event will also feature business exhibits and a myriad of networking opportunities. We invite anyone interested in expanding their global business network while learning about the EB-5 market to join us at this expo. Who will attend this event? For information regarding sponsorship opportunities, contact our team today by phone at (800) 997-1228 or email at info@eb5investors.com.